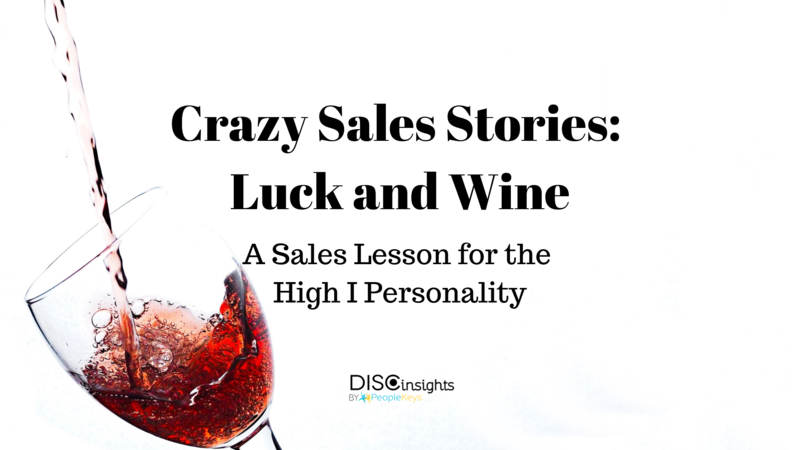 As I started sharing in my previous story, Corporate Selling Without Your Shoes, I have been in some crazy business situations through the years. Some were truly hilarious and remarkable, and while some had crazy tactics that worked and some did not. Here is another story of one that went surprisingly well considering the outcome was left to chance. In a previous life, I was the Engineering Manager for a manufacturing company, and each year the company exhibited at a huge, national manufacturing trade show in Chicago. One particular year I attended this show, a young, new salesperson for the company (we’ll call him Brian) asked me to attend dinner with him and a prospective client he was working with. He had no idea of the potential of the sale. I went to assist him with the relationship building opportunity, which is always important. That night at the restaurant, the prospective new client asked if he could order from the wine list. Brian (the young salesperson) said, “Please, let’s get some good wine. I don’t know that much about it.” He was definitely an “I” personality style, was really good at making strong relationships quickly, and was very open to share his desire of wanting to have a very enjoyable evening with his new friends. My role that night, which I enjoyed, was to assist in answering some questions about how our designs worked. Other than that, we experienced a nice dinner and wine…and more wine…and more wine. At the end of the evening, Brian nervously got up, tapped me on the shoulder and asked if I could go to the restroom with him. I am not accustomed to being asked this, but I could sense he needed to tell me something important. I excused myself and went with him. When he pulled me aside, I quickly found out that he got the check and it was $1,500 for wine alone and another $200 for the meals. Apparently, the 6 of us went through 5 bottles of wine at $300 a bottle! Brian’s comment was, “Can you put this on your credit card account because I am going to get fired if I put it on mine.” He said, “The President of the company will call me in…not even the sales manager, but the President…and personally fire me.” I later found out it was only his second month with the company and was told to watch his expense account. We paid the bill and I did not see him again that week until we were back in the office the following Monday. Unknown to me and Brian, the client had faxed over a large order for some very profitable items we produced. It was an incredible sale! It was funny to watch Brian then pretend he knew the client was placing the order before we took him to dinner, when the fact was we had no idea he would ever buy anything from us. Brian and I became good friends over the years and though I have lost touch with him now, I often think of all the places we went as a team. As promised, we never spent that much on wine again (not even close). The lesson of the story is that you should not leave your business deals to chance! Gain the tools you need to close more deals by learning how to communicate more effectively, persuade and influence others. A good starting point would be signing up for the Selling With Personality Course.